Address: 52 York St, Launceston, TAS. 1907 Numeral Series 1d(11), 2d(12x11.5), 3d(12x11.5). 1918 5d on 10/- Dragon. 1919 Numeral Series (underprint) 3d, 4d, 5d. 1920 Numeral Series Perfed 2d(12), 2d(12x11.5), 4d(11), 5d(12x11.5), 6d. 1920 Numeral Series Roulette 2d, 3d, 4d, 5d, 6d. 1907 Numeral Series 1d R2, 3d R3. 1918 5d on 10/- Dragon R4. 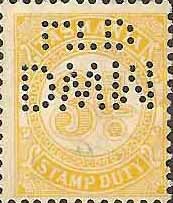 1919 Numeral Series (underprint) 3d R2, 4d R3, 5d R3. 1920 Numeral Series Perfed 2d R2, 4d R2, 5d R3. 1920 Numeral Series Roulette 2d R3, 3d R2, 4d R2, 5d R2, 6d R2. 1917 1st Series 3d, 9d. 1918 2nd Series 9d, 1/-. 1917 Series 3d R4, 9d R4. 1918 Series 9d R4, 1/- R4. Background: *1 *2 David and William Murray were born in Fife, Scotland and immigrated together to South Australia in 1853. Their they set up a retail drapery store in Gilbert Place and in 1855 they moved to larger premises in Grenfell Street. In 1862 they turned entirely to the wholesale trade and in 1866 moved to a site in King William St. In 1867 they opened a clothing factory and later others for boots and shirts. Consistent with their growing role in wholesale in 1874 they opened an indent and merchandise department as well as a London agency where their father acted as their buyer, financier and general agent. In 1886 the company moved into a new five-story warehouse in Gawler Place. In 1897 the firm became a limited liability company and this lead to a further expansion fuelled by a series of acquisitions including, Scott Dawson & Stewart (Brisbane and Townsville), L. Stevenson & Son Ltd. (Melbourne and Launceston), and Henry Bull & Co. Ltd. (Sydney) as well as a merger with Goode, Durrant and Co (Perth). David moved permanently to London in March 1900 but remained a senior partner until his death in 1907. 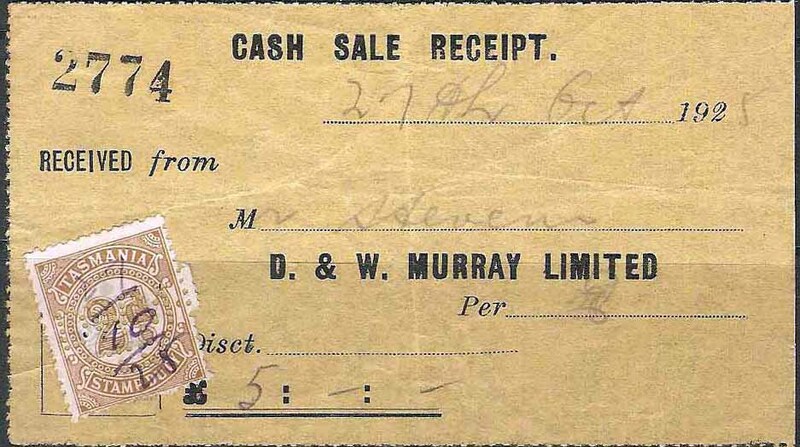 In all D & W Murray had branches in Melbourne, Brisbane, Sydney, Perth, Launceston, Rockhampton, Townsville and Broken Hill. DWMLTD.1 This has been reported with both Victorian and South Australian usage. It is actually two similar devices, one located in Melbourne and the other in Adelaide. The patterns are slightly different in the structure of the right hand corner of the ‘M’. 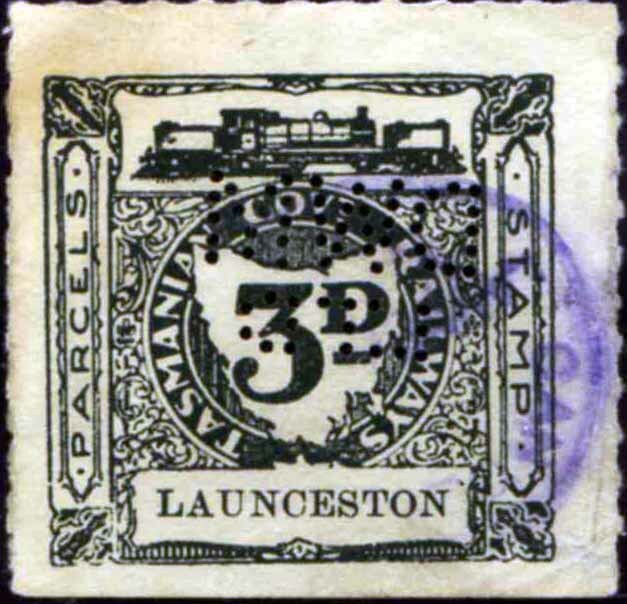 DWMLTD.2 This is the DWM/LTD.a device and it was located in Launceston and is the only D & W Murray pattern found on revenue stamps. It is reported with Queensland usage but this is not supported by our research. The pattern is also reported with usage from 1901 but again this is not supported by our research. In fact we can only confirm usage from 1912 and this may indeed explain the report of Queensland usage as there was a small amount of cross State usage of postage stamps in the immediate pre Commonwealth period in an attempt to reduce stocks of State stamps. We would be confident that the usage was exclusively in Launceston. DWMLTD.3 This is another Launceston device with the DWM/LTD format in a larger size that was used between 1930 and 1940. It co existed with the DWMLTD.2 / DWM/LTD.a pattern and may have been at a separate Launceston location. DWMLTD.4 This was a Melbourne device that came into service in about 1924 and it most likely replaced the Melbourne DWMLTD.1 device, which started to degrade in 1913 and since 1914 produced very poor strikes. This DWM/LTD.a device was most likely a single head device and it is found in a variety of positions. Examples of multiples show inconsistent relationships between strikes, which is characteristic of a single head device. 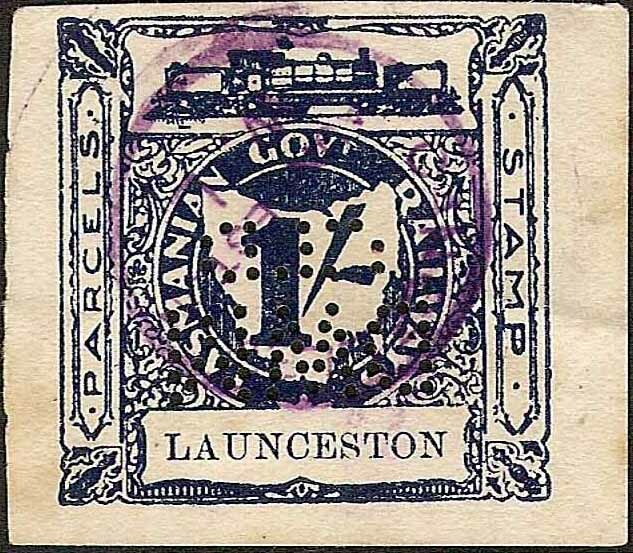 As stated above it is the only DWM/LTD device found on revenue stamps and it is found used on Tasmanian postage stamps from 1912 and then the issues of Australia until at least 1948.